These cities highlight two of Colombia's most scenic areas—the Andes and the coasts along the Pacific and the Caribbean. Colonial charm, modern cities, and beach resorts with access to archeological ruins are just some of the many delights these cities in Colombia have to offer. Nestled high in the Andes at 2,620 meters—the equivalent of 8,646 feet—Santafé de Bogotá is a city of contrasts. High-rise buildings stand next to colonial churches tucked among universities, theaters, and shantytowns. The culture here is a mixture of Spanish, English, and Indian influences. Bogota is the capital of Colombia and its economic center. Emeralds are big business here. You'll find the best restaurants and nightlife in the Zona 1 Norte neighborhood, and many of the historical sites are located in the La Candelaria district. Once known for its high risk of violence, Bogota and other large cities in Colombia are a bit safer these days, at least inside city limits. The potential still exists for acts of terrorism by various factions, however, particularly in outlying areas. Take precautions when traveling in this region. The Caribbean port of Cartagena de Indias was founded in 1533. Its old walled city and fortress, called the Ciudad Amarullada, once repelled invaders and pirates. These days it welcomes visitors with its tiled roofs, balconies, and flower-filled courtyards. The weather is warm and sultry in Cartagena, and the city offers plenty of nearby attractions and an energetic nightlife. Be sure to visit Casa de Marques Valdehoyos, located in an old Cartagena house. The tourist office here can point you to other sites you might find interesting. The Las Bovedas military dungeons are now home to boutiques and tourist shops. Visitors looking for superb diving in crystal clear waters can head to San Andrés, a Colombian archipelago in the Caribbean. San Andres offers white sandy beaches, exciting nightlife, colorful culture, a choice of full-amenity accommodations, relaxation and duty-free shopping. It's located close to Nicaragua and Jamaica, a carefree attraction away from the potential dangers of mainland Colombia. Originally settled by the Spanish in 1510, the cluster of islands that includes San Andres once belonged to Panama, then to Guatemala and Nicaragua. They attracted the attention of Dutch and English privateers, and Henry Morgan's treasure trove is said to be hidden in one of the island caves. The island is laid out for easy walking, but you can rent a scooter or moped if you really want to get around and hunt for hidden caves full of treasure. 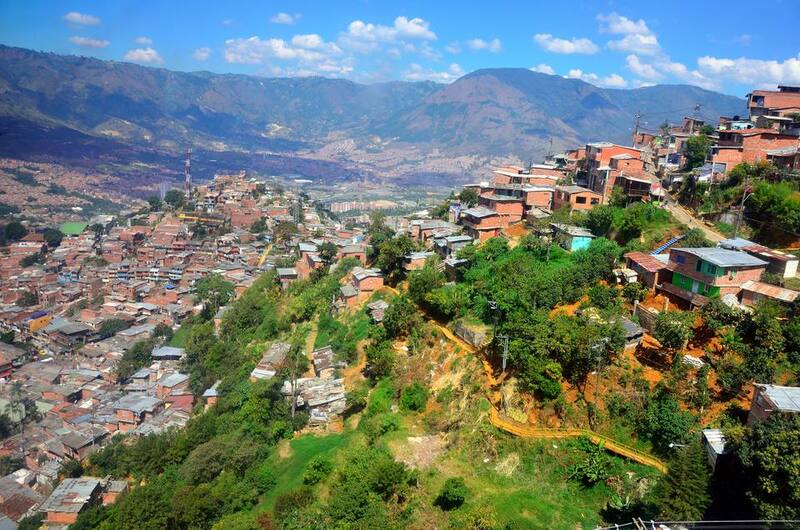 Medellin is the capital of Antioquia department in Colombia. It's been called "The Land of Eternal Spring" and "Capital of the Flowers" thanks to its temperate climate. You can count on an explosion of orchids each year at the Jardin Botánico de Medellin Joaquin Antonio Uribe in the Orquideorama. Medellin is Colombia's second largest city. Founded in 1616, it remained small and cozy until the coffee boom, then later became the center of a textile industry. Today it's a modern, vibrant city. The climate here makes any time of year good for a visit, but early August, when the Fería de las Flores is scheduled, is considered the best time. Santa Marta is Colombia's first Spanish settlement. Located on the Caribbean coast, it boasts great beaches and access to the Tayrona and Sierra Nevada de Santa Marta national parks. It also provides access to the famed lost city of the Taironas. Santa Marta is a great base to travel to other cities along the Colombian coast, but it's also home to a few attractions of its own. Visit La Quinta de San Pedro Alejandrino, home to Simón Bolívar during the last years of his life. A museum houses art donated by many of the countries he helped to liberate. Parque Arqueológico de San Agustín is a huge park in the Magdalena River gorge in southern Colombia where centuries ago, before the time of the Incas, people interred their dead in tombs guarded by fierce stone figures, some with animal features, some mythical, all intriguing to archaeologists and visitors alike. This is just a short distance from Popayan, also known as the "white city" in Colombia. Cali is Colombia's third largest city and a center for sugar and coffee industry. If you're looking for things to do in Colombia and want to dance look no further than Cali. It enjoys a terrific nightlife in the Salsotecas, and visitors enjoy the historic center as well as excursions into the surrounding areas for sugar baron haciendas and the prime archaeological sites of San Augustin and Tierradentro. This charming town, nestled in a serene valley setting, is one of Colombia's most beautiful colonial towns with a rich religious and cultural heritage. Fully restored after an earthquake, it's a national monument and known for its spectacular Semana Santa celebrations. If you're looking for a quiet rest in a small, quaint town this is a great place to visit.